I’ve always been a sucker for bonnets and when I saw Larissa Brown’s new bonnet eBook, Love Bonnet, I wanted to knit them all. Problem is, I don’t have many infants to knit for these days, and needed a larger size. So, I have created a larger bonnet pattern, based on Larissa’s “Juniper Bonnet”, which is a free pattern. Hoping that the bonnet for older kids and toddlers in bigger sizes will be the new trend, so I can knit some more….. a natural transition from the earflap hat and sock monkey hat fads this past fall and winter. 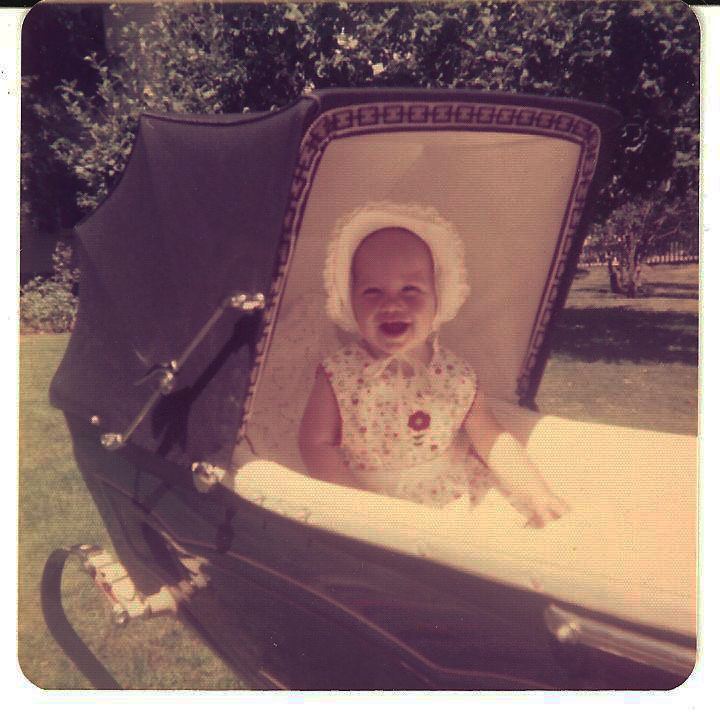 Call me “crazy,” but the bonnet is so practical…great hat to wear with ponytails. In the Nordic countries, all ages wear ski bonnets…just because it’s called a bonnet, doesn’t mean it’s for babies. This one is trimmed in a little dove gray cotton and knit with about one skein of soft grape wool and alpaca for Easter, which is rarely a warm time in New England. The bonnet doesn’t have to be tied, but the ties can hang down, like the older children usually prefer to wear them. 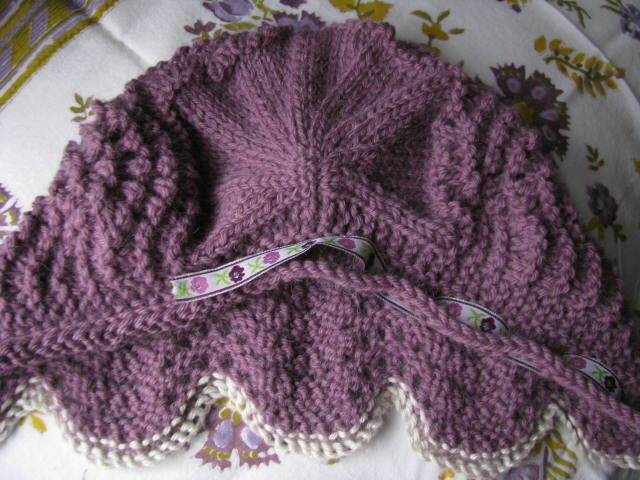 There are five repeats of the feather and fan in this larger bonnet pattern. The finished size of this one is about 17 inches around and will fit up to a six year old. If you are interested in this larger size feather and fan bonnet for toddlers, kids, and older heads, please subscribe to this blog and let me know by leaving a comment. 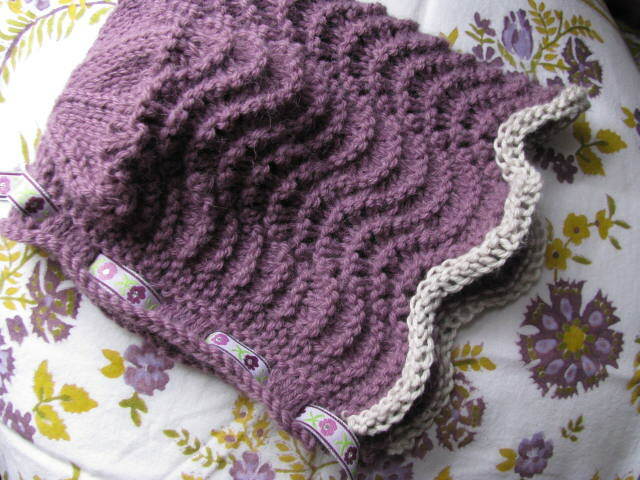 I also plan to write a larger bonnet pattern for a plain stripe design. 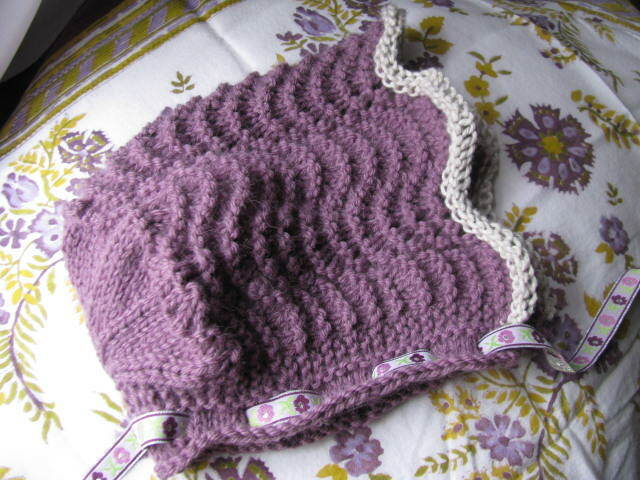 For Larissa’s Juniper Bonnet pattern, written for infants, click here. As a New Year brings hope and promises of good cheer, I’m wishing “Happy New Year” to all on this eve of 2011. 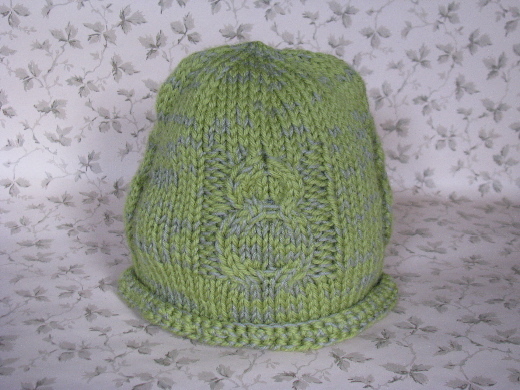 To celebrate…a new Wattery Totteries design for a baby owl hat with three baby owls. We’ve always been big watermelon fans…partly because watermelons are so refreshingly tasty in the summertime, and often, a nickname for our Watterson family. I do remember sitting on my grandmother’s back steps with the rest of my cousins in the summer time, eating watermelon and spitting the seeds in the garden. Granny always “toted one home”, as she called it, on Fridays, after sewing upholstery in the furniture factory. 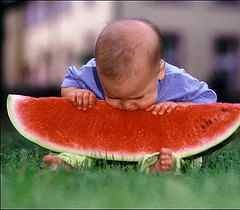 It’s a wonder there wasn’t a watermelon farm growing in Granny’s backyard. Simple pleasures and great memories.